School is in session now. The big kids are busy learning, not occupying the younger ones anymore. When a rainy day comes along and the little ones need something to do. I’ll show you how to build a rainy day fort. Decide how big of a mess you’re willing to make building your fort. 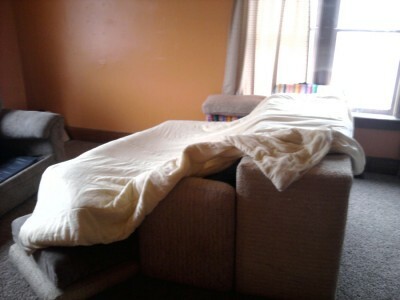 My favorite way to build a rainy day fort is with the couch. The couch we used to have was completely rectangular, and could be flipped on its front. This created an effective “cave”. Once the cave base is created, the use of dining room chairs and the couch cushions builds out the walls. The last thing to do is cover over the top of the fort with blankets and quilts. Occasionally we have use yoga mats as well. These things work well to create a fort that kids love! If you leave it up all day, the big kids will be envious of the fort, and play inside after school. Great, so you’ve built a fort for the kids. If it is dark inside, kids love to play with lit up toys like Nintendo DS , as well as Lite Brite , and simple Flashlights . Often times we build the fort with an opening towards the TV. Then kids can watch videos on Amazon Prime or another video service. Snacks inside the rainy day fort are always a plus. I recommend snacks that are dry and not messy, as this fort is made from your couch and blankets. The stuff is a mess, but the stuff isn’t messy yet! 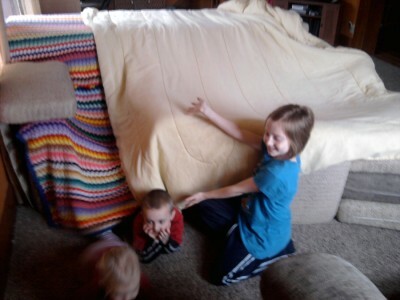 The memories your kids make building their rainy day fort with you will last a lifetime. I know they did for me!